Rodale Institute and Penn State College of Medicine announced a partnership to connect food production with health care and to promote and improve public health. 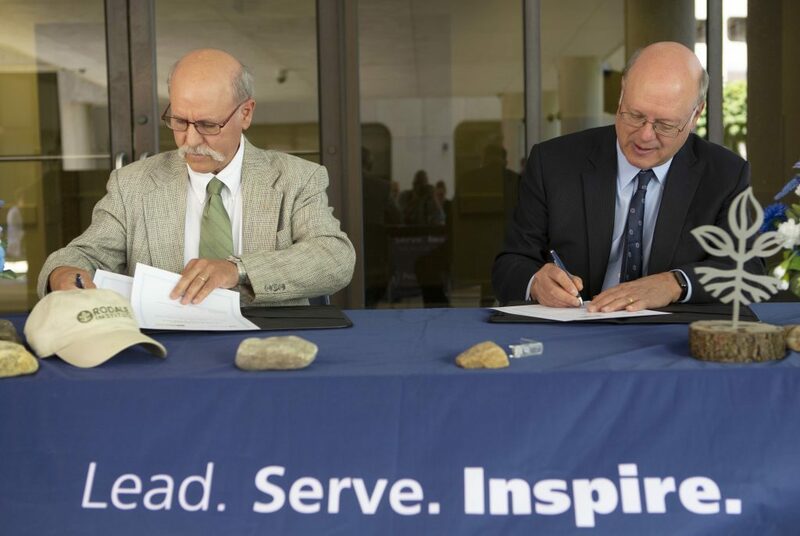 To celebrate our shared commitment to expanding access to organic foods and fresh produce, we signed a memorandum of understanding and celebrated the collaboration with a tree-planting ceremony on the campus of Penn State Health Milton S. Hershey Medical Center. Dr. A. Craig Hillemeier, right, Dean of Penn State College of Medicine, CEO of Penn State Health and Senior Vice President for Health Affairs at Penn State and Jeff Moyer, the Executive Director of Rodale Institute, participate in the Rodale MOU Signing Event at Penn State Health Milton S. Hershey Medical Center on Thursday, June 14, 2018. Already our work together has resulted in increased access to healthy food for vulnerable families. The College of Medicine’s Food as Medicine Program helps doctors and patients, including low-income and refugee patients, incorporate healthy food into healthcare plans, and Rodale Institute’s Agriculture Supported Communities program provides organic produce to underserved communities while simultaneously training new farmers. Dean Hillemeier highlighted the scientific research the College of Medicine has most recently conducted with Rodale Institute: “University Park food scientist Robert Beelman specializes in the nutritional value of mushrooms, and whether specific nutrients found in them can help to prevent or treat neurodegenerative disease of aging, such as Parkinson’s and Alzheimer’s,” he said. “But how you grow the mushroom is important, and Dr. Beelman and his team are working with Rodale scientists to determine the impact of modern agricultural practices on the nutritional value of foods, including those mushrooms.” Another collaborative project is an investigation into the health benefits of purple fleshed potatoes. Initial research has revealed that organic no-till growing practices increase their nutritional value and that consuming them can help prevent colon cancer. Rodale Institute donates organic plants to the Hershey Community Garden, which helps to provide food for Penn State Health Milton S. Hershey Medical Center as well as families that live in food deserts and resettled refugee families. 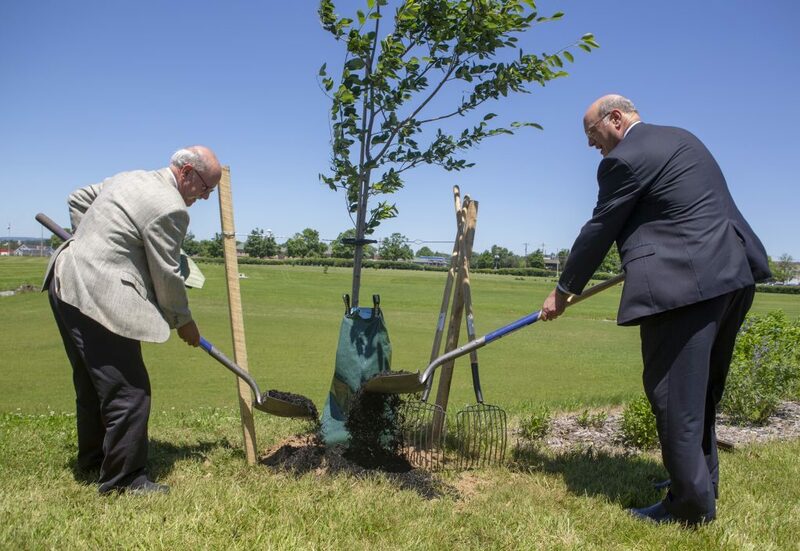 Dr. A. Craig Hillemeier, right, Dean of Penn State College of Medicine, CEO of Penn State Health and Senior Vice President for Health Affairs at Penn State and Jeff Moyer, the Executive Director of Rodale Institute, lay dirt on a ceremonial tree following the Rodale MOU Signing Event at Penn State Health Milton S. Hershey Medical Center on Thursday, June 14, 2018. “This is an exciting time for Rodale Institute for Penn State College of Medicine and for everyone who thinks of food as part of a long-term strategy for improved health,” said Jeff Moyer, executive director of Rodale Institute. “For too long, agriculture has focused on the idea that yield at any cost is the metric by which we should judge success. Inputs of synthetic pesticides and salt-based fertilizers are necessary to sustain those yields, and there is little regard to the nutritional quality of our food and the impacts these production methods have on human health. We are here today to share a different vision for a more promising future,” he continued. To mark the occasion, the College of Medicine and Rodale Institute planted a serviceberry tree, native to the region and an important source of sustenance for wildlife. 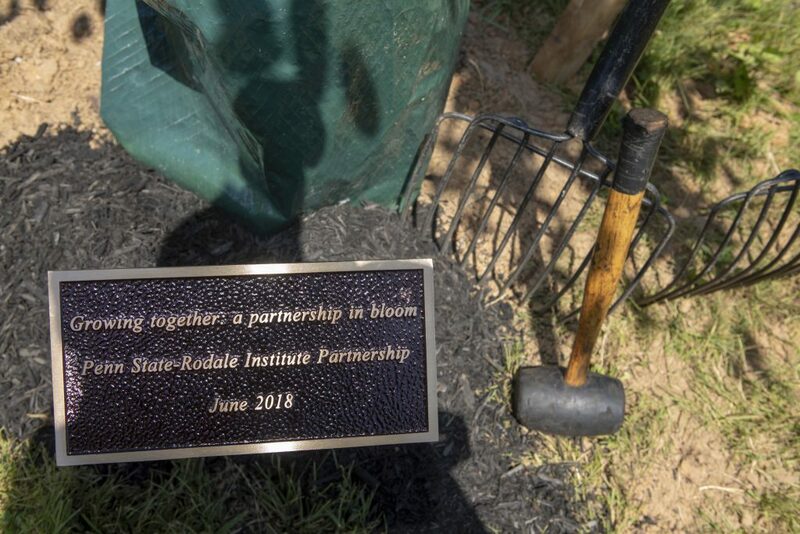 Its planting is a representation of the College of Medicine’s and Rodale Institute’s joint efforts in supporting the health of the community. View photos from the Rodale Institute & Penn State College of Medicine MOU Signing event. Dr. A. Craig Hillemeier, Dean of Penn State College of Medicine, CEO of Penn State Health and Senior Vice President for Health Affairs at Penn State and Jeff Moyer, the Executive Director of Rodale Institute, planted a sign near a ceremonial tree following the Rodale MOU Signing Event at Penn State Health Milton S. Hershey Medical Center on Thursday, June 14, 2018.